Gibson TB-1 Model Tenor Banjo (1923), made in Kalamazoo, Michigan, serial # 11803-23, shaded maple finish, maple neck and rim, ebony fingerboard, original black hard shell case. Here's a "Loar" that wont break the bank-a 1923 early Mastertone-era TB-1. The "trapdoor" banjos from this period are lovely instruments, though not the design Gibson would eventually be remembered for. 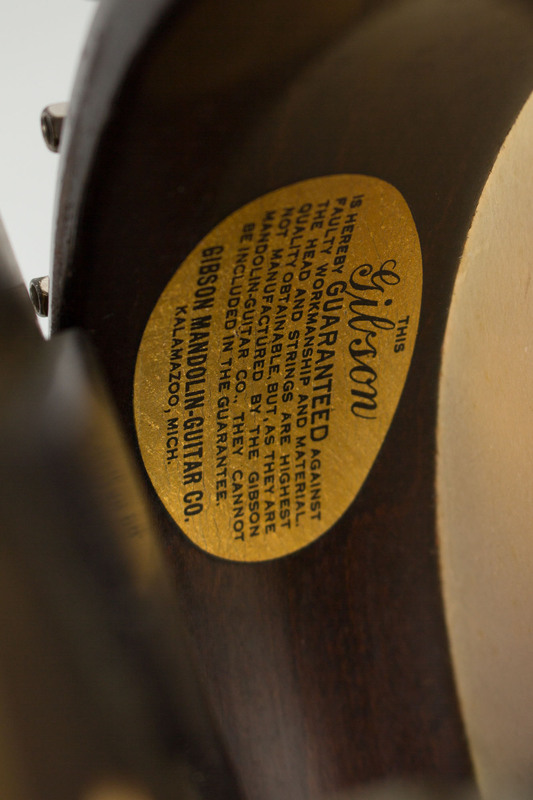 They have the feel of having been designed by and for mandolin players - as indeed they were. 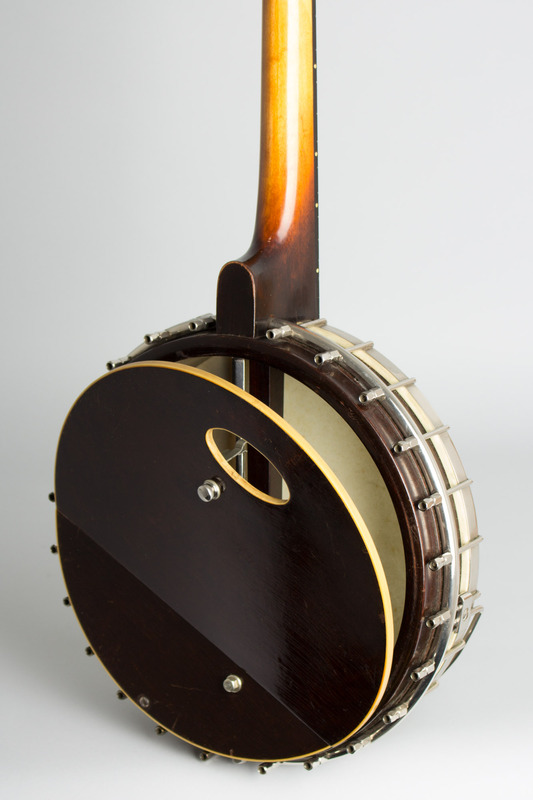 While never particularly popular among tenor banjo players, they are beautifully built instruments with an attractive nouveau aesthetic all their own. The TB-1 was a lower grade banjo but still has some of the professional features: the "trapdoor" resonator and the new coordinator rod to adjust neck angle. 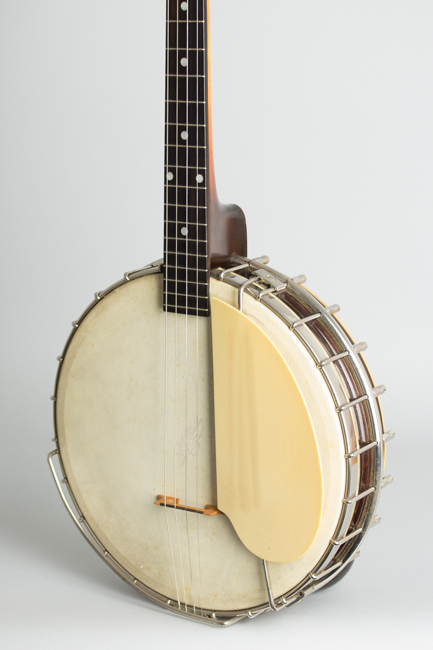 The hook/nut bearing tube used on this banjo would become half of the "tube and plate" flange system when the "plate" flange was added in 1925. This banjo is one of the earliest to feature Gibson's single co-coordinator rod, mounted below the traditional wooden dowel and marked "Patent Applied for". 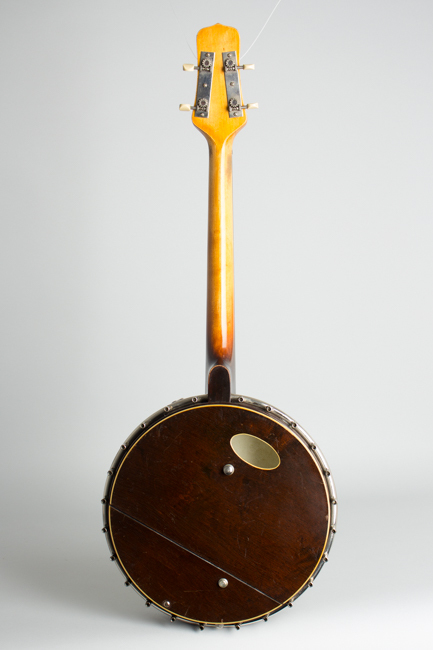 The rim of this early style TB is solid but has no tone ring-Lloyd Loar's "ball bearing" ring was used on the higher grade styles. 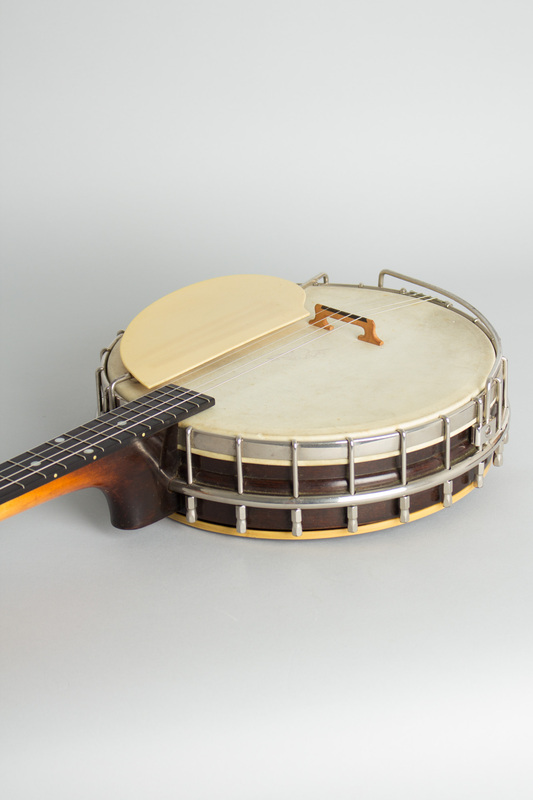 It does feature the unique "trap door" resonator system, a hinged plate on the back that can be opened or closed to make the tone louder or softer, increasing the "Banjo piquancy' in Gibson's language! 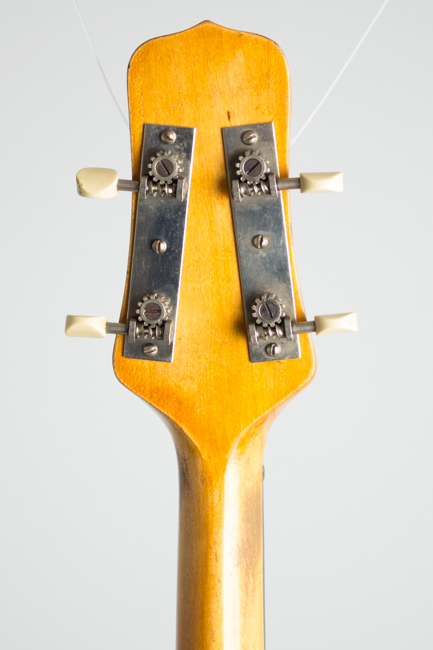 It also has the optional original wire armrest and ivoroid pickguard fittings. With a very short 19" scale length this is a handy little player, suitable for ragtime or Irish styles and a neat double for the mandolinist-just as Gibson intended. Overall length is 29 in. (73.7 cm. ), 10 5/8 in. (27 cm.) diameter head, and 2 3/4 in. (7 cm.) in depth, measured at side of rim. 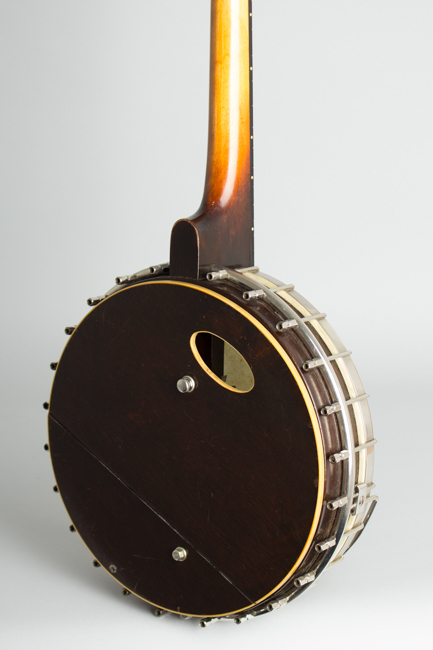 Scale length is 19 in. (483 mm.). Width of nut is 1 1/8 in. (29 mm.). 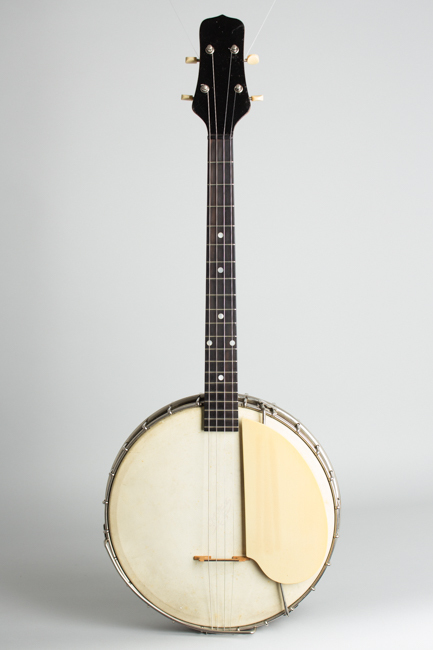 This banjo is in fine original condition with some minor wear to the finish and plating, but no alterations except a non-Gibson correct period bridge. It is complete with a period skin head and all hardware intact except the tailpiece cover, which has gone missing. 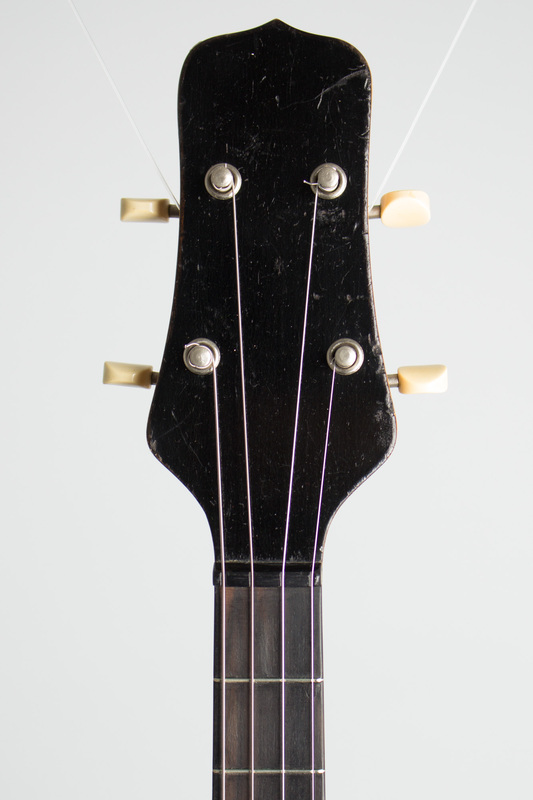 The frets show some wear but it plays well, a nifty little package of plonking fun complete in its original green-lined HSC. Excellent Condition.